cab drollery: Oh My, Michele! It's one thing to have your home town newspaper come done on you for your really stupid and weak fabrications, it's something else when a major national newspaper does it. 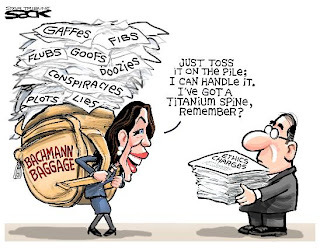 We searched high and low for any statements that Bachmann made at the time warning about the “calamities” that would fall on the poor because of budget cuts. And what did Michele win for this egregious bit of flim-flammery? A rating of "Four Pinocchios", the highest rating for lies in a fact check. Once again, Michele has ignored the basic rule of staying alive in politics: don't lie if there are ways to prove you are lying. This is getting to be too easy a target.